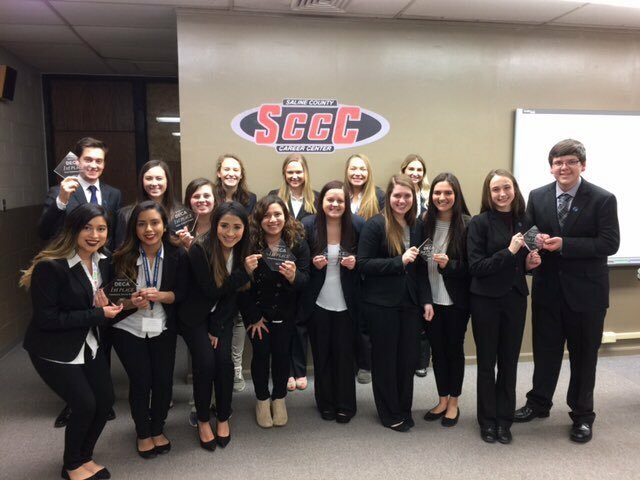 Thirty-one DECA students from Saline County Career Center attended the DECA District Competition on February 8, 2017 at Independence Center. DECA prepares emerging leaders and entrepreneurs for careers in marketing, finance, hospitality and management. These students competed in a variety of events for a chance to represent their district at the State Career Development Conference to be held at the Lake of the Ozarks on March 12-14. The Saline County Career Center had 20 students who were recognized onstage: Jacquelyn Brown, Logan Evans, Olivia Quint, Lauren Adcock, Clara Rouk, Wendy Cortes, Alli Griffitt, Haleigh Hartwig, Selena Serrano, Esmeralda Tinoco, Molly Angelhow, Taylor Bellamy, Casey Claros, Tiara Tindell, Jani Tobin, Zach Baker, Katie Miles, Mariana Lopez, Anna Hartley, and Rileigh Massey. 19 of those will advance onto State competition.